The profound and permanent anthropogenic imprint on the planet and the accelerated rate of environmental change has opened a lively debate about establishing a new human-made geological epoch: the Anthropocene. 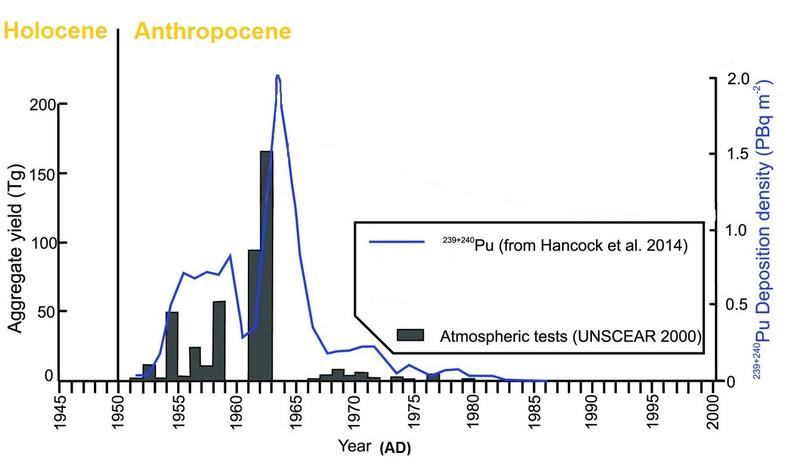 Widely covered in by the public media, the Anthropocene Working Group has officially recognized that human impacts on the environment are of sufficient scale to be considered as a new geological time and agreed that such time started at AD 1950 with the global-wide spike of radionuclides resulting from atmospheric nuclear bomb testing. Significantly for Quaternary scientists, recent paleoclimate investigations proved to be important in defining the onset of the Anthropocene epoch. At the end, these investigation provided evidence to refute proposed pre-instrumental dates as the starting point for this new epoch, helping to tip the balance towards AD 1950 as the best candidate. Early last year, Lewis and Maslim (2015) reviewed the history behind the concept of an Anthropocene epoch in the Journal Nature1. Considering the formal criterion for defining a geological epoch; that is, the existence of a global-scale signature in stratigraphic material, the authors proposed two specific dates or “golden spikes” for the initiation of the Anthropocene: AD 1610, associated with the collision of the old and new worlds; and AD 1964, associated with the great acceleration of industrial production. In favor of AD 1610, Lewis and Maslim (2015) listed a series of evidence for global environmental change at around that time, including minimal atmospheric CO2 concentrations in Antarctic ice cores and the presence of exotic fossils markers in sediment sections as new crops and animals started to be exchange between continents. Furthermore, based on a series of articles published between 2008 and 2011, the authors suggested that the drop in atmospheric CO2 recorded in Antarctic ice cores between AD 1580 and 1650 (Figure 2) was caused by an increase in the terrestrial CO2 uptake resulting from a large-scale forest expansion in previously cultivated lands across the Americas. This reforestation followed the dramatic decline of indigenous populations due to socio-political upheaval, famine and disease, brought about by European colonization and exploitation. In other words, Lewis and Maslim (2015) suggested that human activities were behind the CO2 and temperature decline during the coldest part of the Little Ice Age. A human-driven cooling during Little Ice Age turned out to have wider implications because recent studies have shown that changes in atmospheric CO2 over the last millennium were sourced in the terrestrial biosphere and not in the oceans2. This evidence further opened the enticing possibility that major events in human history over the last 1,000 years could have produced minor -albeit global- variations in atmospheric carbon dioxide3. All these events occurred several centuries before what it is generally accepted as the onset of global anthropogenic impacts, and certainly well before AD 1950. However, it has long been noted that the net flux of CO2 between the atmosphere and the terrestrial ecosystem is not only controlled by the rate of vegetation uptake (termed primary production), but also by the emissions of CO2 from animals, fungi and some microorganisms (termed terrestrial respiration). Thus, any drop in Atmospheric CO2 could be caused either by an increase in primary production or by a shutdown of the terrestrial respiration. Bearing these principles in mind, an article published in Nature Geosciences this month4 challenged the suggestion of a human-induced drop in CO2 during the Little Ice Age. Interestingly, this new study did not focus directly in carbon dioxide but on Carbonyl Sulfide (CAS), an organic molecule also present naturally in the atmosphere. Like CO2, CAS is removed from the atmosphere by the terrestrial vegetation. Yet, unlike CO2, CAS is permanently incorporated into plant metabolism and not emitted back to the atmosphere. In other words, atmospheric CAS is a direct measurement of the primary plant production. Rubino et al (2016)4 shows that low concentrations of CO2 during the Little Ice Age are contrasted by an increase in the concentrations of CAS (Figure 2). These opposite changes are a strong indication that a reduction –not an increase- in plant uptake occurred during the Little Ice Age. A CO2 decrease induced by large-scale forest regeneration is therefore unlikely because vegetation re-growth would have dropped CO2 and CAS simultaneously. Instead, the results are consistent by a proportionally larger decrease in the terrestrial respiration (which reduce CO2 emission but does not affect CAS concentration). The new study of Rubino et al (2016) points to the fact that cooling in the earth system rather than human activities were behind the CO2 decline during the Little Ice Age. In other words, this new study provides evidence against the proposition of AD 1610 or any previous date as the “golden spike” for the beginning of the Anthropocene, adding indirect support to AD 1950 as the best date for the beginning our current epoch. Figure 2. Upper: atmospheric CO2 concentration recorded in during the little Ice Age in the ice core record of Law Dome, Antarctica4. Lower: Carbonyl Sulfide (CAS) concentration anomaly relative to pre-industrial values4. Figure modified from Rubino et al (2016)4. All these recent studies highlight how important paleoclimatic and paleoecological research is to our overall understanding of the current trends of the earth systems. As showed in a recently published revision of the industrial-era warming this month5, the entire instrumental time series are immersed into a long-term warming ramp, making instrumental data too short to fully investigate the drivers and structure of the current warming trend. Formal definitions do not change tangible anthropogenic impacts; neither do they change future scenarios of environmental change, and therefore a debate over when did precisely the Anthropocene began may not be of any significant relevance for the general public. However, the footprints of human activities are now undeniably global and certainly will be detectable for thousands of years to come. Establishing a starting date for the Anthropocene not only has scientific relevance but also social and political implications for the way we understand our relationship to the environments around us – which we invariably depend upon. For example, agreeing that the Anthropocene starting point occurred earlier than the 19th industrial revolution would have effectively dismissed the accelerated modern industrial scale of greenhouse gas emissions since AD 1950, and their associated global warming impacts. The proposed definition of the Anthropocene will need to be ultimately recognized by the International Commission on Stratigraphy (ICS), a process that might be argued over several years. Lewis, Simon L., and Mark A. Maslin. “Defining the anthropocene.” Nature 519.7542 (2015): 171-180. Bauska, Thomas K., et al. “Links between atmospheric carbon dioxide, the land carbon reservoir and climate over the past millennium.” Nature Geoscience 8.5 (2015): 383-387. Kaplan, Jed O. “Holocene carbon cycle: Climate or humans?.” Nature Geoscience 8.5 (2015): 335-336. Rubino, M., et al. “Low atmospheric CO2 levels during the Little Ice Age due to cooling-induced terrestrial uptake.” Nature Geoscience 9.9 (2016): 691-694. Abram, Nerilie J., et al. “Early onset of industrial-era warming across the oceans and continents.” Nature 536.7617 (2016): 411-418. Waters, Colin N., et al. “The Anthropocene is functionally and stratigraphically distinct from the Holocene.” Science 351.6269 (2016).